Charles Cecil Bailey is named on the Bottesford ‘church list’ of WW1 servicemen. He was a son of Henry and Mary Bailey, both born in Bottesford, Henry in 1852 and Mary in 1857. Charles was born on the 12th June, 1891, also in Bottesford. In the census of 1901, Henry Bailey was described as a foreman/platelayer, aged 49. The Bailey family lived on Belvoir Road, Bottesford. There were five children at home. The oldest were daughters Mary (23) and Eliza (20) who was employed as a cook and domestic servant. Next oldest was Thomas, aged 14 and already working as a gardener. Then came William (12) and Charles Cecil (9), the youngest. Neither of his older brothers are on the ‘church list’, and details of their war service have not yet been determined. 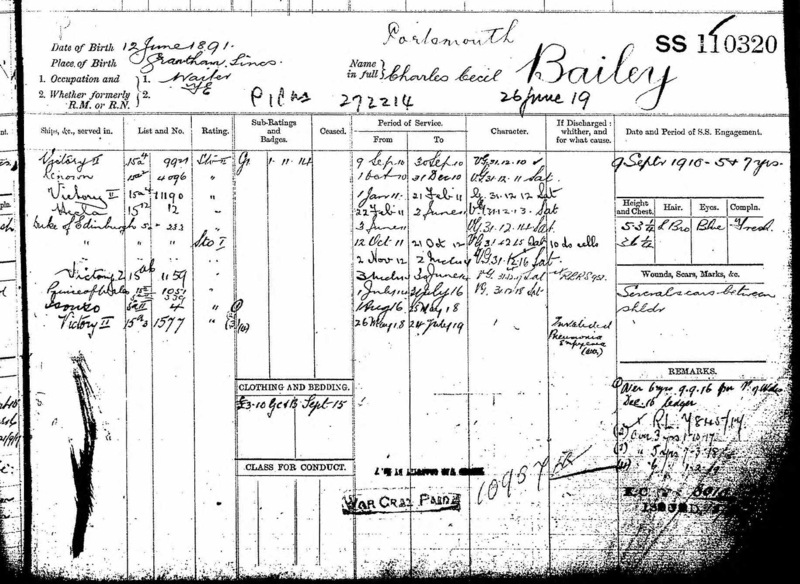 Charles Bailey joined the Royal Navy at Portsmouth on the 9th September, 1910, having previously worked as a waiter. His service number was SS110320, his rank Stoker II: he was promoted to Stoker I from the 12th October, 1911. 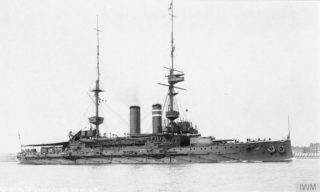 He was based at the Portsmouth shore establishment HMS Victory II, and also had a spell on the training ship HMS Renown. Before the start of WW1 he served on board destroyer HMS Bonetta and torpedo depot ship HMS Hecla, and then on the armoured cruiser HMS Duke of Edinburgh. In the 1911 Census, Charles Bailey was recorded as one of the crew of a ship anchored in St Helen’s Road, Bembridge, Isle of White, where he was a Stoker II on board HMS Bonetta, a torpedo boat or destroyer of the 4th Destroyer Flotilla. He joined the battleship HMS Prince of Wales in 1914 and remained on its crew until July 1916. This ship was part of the Channel Fleet in 1914, then supported the Dardanelles campaign before moving into the Adriatic to support the Italian navy against the Austro-Hungarian navy. For the period 1/6/1916-25/5/1918, his record has the simple entry “Isonzo”, which must indicate that he was involved in the prolonged Isonzo campaign in NE Italy, presumably continuing on board the Prince of Wales. However, he returned to Victory II on the 26th May, 1918, and did not go to sea again according to his service record. On the 24th July, 1919, he was invalided out of the navy on suffering from pneumonia and emphysema, presumably the result of his years working as a stoker. His Medal Index Card records that he was awarded the Star, Victory Medal and British War Medal. There are few details of his life after 1919. However, the 1939 register recorded a man named Charles Cecil Bailey, born on the 12th June, 1891, a post office labourer who lived at 22 Fairmont Crescent Scunthorpe, married (though his wife and family were not present). He died Doncaster in 1947, aged 56 or 57. His wife may have been Hannah Allen who married a man called Charles C. Bailey in Nottingham in 1920, but this has not been corroborated.